The new video is actually an addition to another cleanliness campaign commercial, which released earlier. Remember Alia and Varun enacting the balcony scene from Romeo And Juliet in Hindi? Badrinath duo Alia Bhatt and Varun Dhawan are all ready to rocket their way to the moon. Yes, you read that correct - to the moon. Not in real life but for a campaign video for Adar Poonawalla's Clean City Initiative. 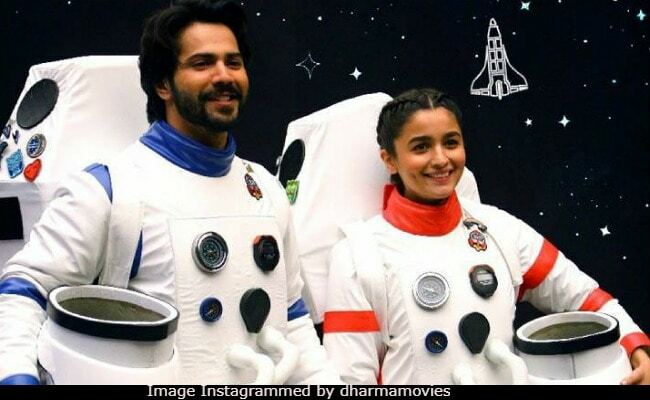 The video released today and ahead of which Dharma Productions has shared a nice still from the sets - both Varun and Alia can be seen dressed as astronauts. After the sneak peek, this is how Alia shared it on Twitter: "Our planet.. Our home! Our duty to keep it clean." After all, the motto is: "Badlega scene jab duniya hogi clean." This is how the storyline of the new campaign video goes. Alia and Varun land on the moon as astronauts for an expedition. But things take a different turn after Varun trashes a piece of chocolate wrapper on the moon. Alia takes off for Earth leaving Varun stranded on the moon as punishment. Before the video arrived, "Get ready for take off! Stay tuned, coming soon," Instagrammed the production house for the new photo of Badrinath and his dulhania. The new video is actually an addition to another cleanliness campaign commercial, which released earlier. Remember Alia and Varun enacting the balcony scene from Romeo And Juliet in Hindi? Filmmaker Punit Malhotra has directed Alia and Varun in the campaign videos as part of Dharma 2.0, which is the creative branch of Dharma Productions and assigns in-house filmmakers to direct adverts and campaigns. Alia and Varun began shooting for the video last month, when Punit shared a photo from the sets, saying: "Shot with astronauts," which was followed by a Judwaa 2 special video by the "astronauts" themselves. Alia Bhatt and Varun Dhawan are co-stars of Student Of The Year and Humpty Sharma Ki Dulhania. They were last seen together in this year's Badrinath Ki Dulhania.